The other day while perusing our local big box retailer I stumbled upon what had the potential to be one of the best salads ever! But to my dismay I was wrong. The dressing was a watery vinaigrette, the chicken was dry and tasteless and the greens were limp. It left me wanting, to say the least. A few days later we were planning for movie night at the beach, and one of us always brings dinner, this time it was my turn, so I decided to make my own Chicken & Waffle salad, and this time it would be delicious!!! (edit: IT WAS DELICIOUS! 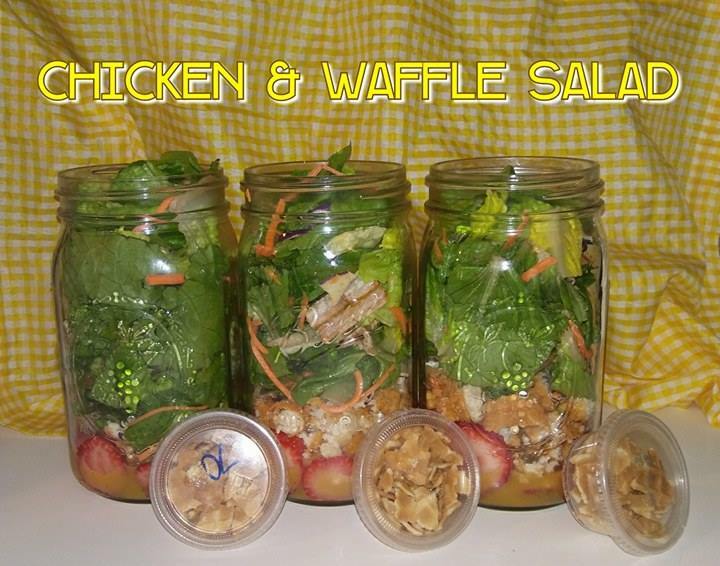 )You can make this as a normal bown salad, or you can layer it up like I did to make a *salad in a jar. *If you are making a jar salad layer ingredients as listed from bottom to top. Mix together 1tbs Honey Mustard Dressing & 1tbs Maple Syrup. 2 Cups Salad Greens- Use your favorite, I used a romain blend.